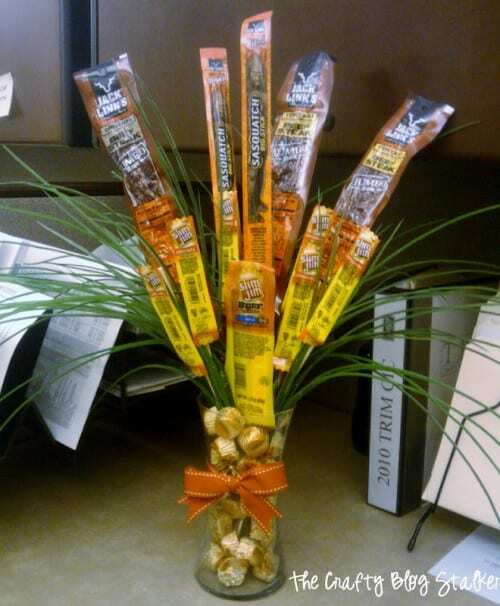 Make your favorite man a manly bouquet filled with jerky and some of his favorite sweet treats. Perfect for Valentine’s Day, Father’s Day, or his birthday. You love your guy, right? But man is he a pain to shop for! If this is true for you too, I am here to help because my husband is the same exact way! I made this for my sweet husband for Valentine’s Day. He loved it and it was a big hit at his office. Sadly, this was before my blog so I don’t have tutorial pictures but it was really pretty easy. I made this Manly Valentine Bouquet for my husband’s Valentine gift several years ago and it is still one that he talks about. Sadly, this was before my blogging days so I don’t have tutorial pictures for you. But it was really pretty easy so I will explain how I made it and if you have any questions you can ask in the comments below. Begin by painting the wood skewers green to match the greenery. Tape the sticks to the back of the jerky sticks. I cut several of the sticks so they would be different lengths coming out of the vase. Tie a ribbon around the vase before you fill it and it is much easier to handle. Put only a handful of the candies at the bottom of the vase. Add the greenery to the vase followed by the jerky skewers and just move them around till the arrangement looks good. Tip: Have the highest point be the center and as the arrangement goes out arrange shorter skewers. Add additional candy to the vase to help hold the skewers in place. This will also help hide the skewers from view. The last bit of candy you will want to place one by one so you can get the perfect placement to hide the skewers inside. There you have it, a perfect Manly Valentine Bouquet!! What holiday or special event will you make one for? Will you add different treats or candy? Share and leave a comment below! SAVE HOW TO MAKE A MANLY VALENTINE BOUQUET TO YOUR FAVORITE HANDMADE GIFTS PINTEREST BOARD! haha Love this!! Great idea! This is adorable! New Follower!!! Saw you from Gluesticks link up! Thanks so much for taking part in our Pin’Inspiration Party. Hope that you are having as much fun exploring as I am and that you’ll take part in helping the “Beat the Winter Blues” on Saturday. HAHA! Great idea! I’ll have to remember this for the hubs! Thanks for linking to Things I’ve Done Thursday! Ha,ha,ha,ha!! My husband would love this!! Most of these are his favorite foods. Thanks so much for sharing with us at Link It Up Thursday. You are going to be featured as part of this week’s Pin’Inspiration Party. Have a fab day! Haha! Awesomeness! I love that. That is most definitely the kind of bouquet my husband would go for! Great idea! Great idea!! My hubby would love this! 🙂 Thanks for sharing!! Awesome idea! Just might do something like this for my hubby! PINNED! Thanks for linking up at my Pin Me Linky Party. I love this, it is PERFECT for a guy!! Love this!!! I featured your idea today on One Creative Weekend! The new party is open. I’d love it if you stopped by, grabbed a featured button, and linked up anything new you’d like to share at OneCreativeMommy.com. I’m totally laughing because this would be my husband’s favorite bouquet! lol Thanks for sharing!